While a cold front is coming this week, its currently 75 or so outside, and that means Spring is here. Which means baseball is back, and Wrestlemania is upon us. Actually both have started (and I think 'Mania is finally over after a 94 hour show) and I'm behind on the times. Honestly I didn't think about posting until I did a little cleaning and found something to display, then took a picture of and thought I'd share on here. Really, I've already posted on twitter, but eh, why not do a blog while I'm somewhat in the mood. I'm pretty sure most of this has been featured at one time or another, but I thought the layout is nice. 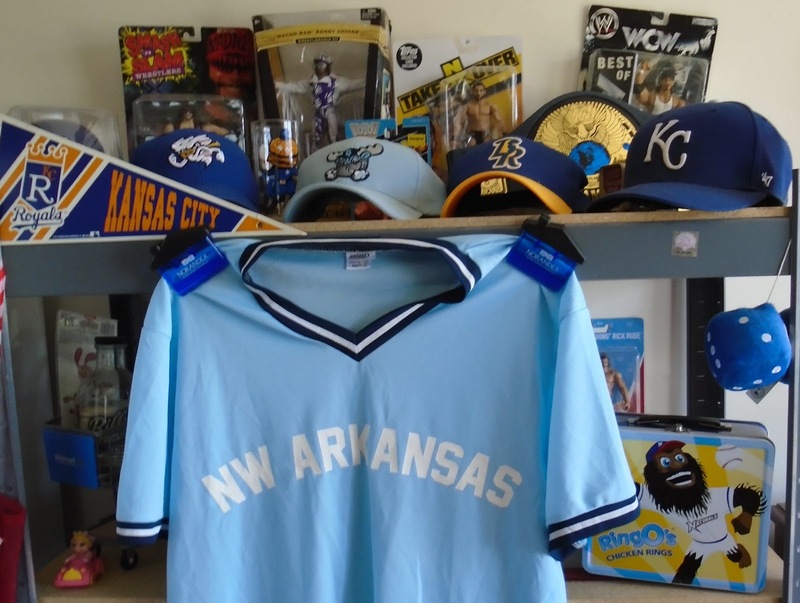 It reflects the Royals and MOST of their minor league teams. The Northwest Arkansas Naturals jersey was a stadium giveaway I found at my local second hand store. The caps are the Omaha Storm Chasers, Burlington Royals, and the Wilmington Blue Rocks. Now if I can find an Idaho Falls Chukars, Lexington Legends, and the Arizona Fall League (not sure if they have caps), as well as a cap for the Naturals, I'd be set. I try to rotate which one I wear out in public, but most of the time my Kansas City cap is worn most the time just because I'm trying to make it look a little worn. People actually called me a bandwagon fan when I bought this one new in 2014. If they only knew, plus I'm sure a lot of them aren't rooting for them right now. At times I'm a bit weary of listening, but I still do. So since I'm talking about baseball, I thought I'd show some cards I bought I guess more than a couple months ago at Savvy Seconds. I saw the price and was curious. It was behind their glass so no idea what was in it. Well... actually I knew what half of them were. This is after I went through the box, and here's a different shot and how I saw the box at the store. 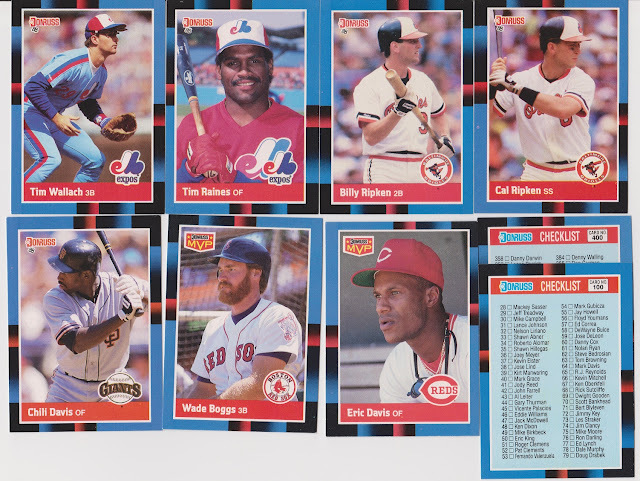 I saw some 1988 Donruss cards and some puzzle pieces. However what caught my eye was the cards that looked miscut and old. Turns out they weren't baseball, but they will be a future post, likely my next one. Its a good one. So let's have a lot of photos and show off what was in this box. 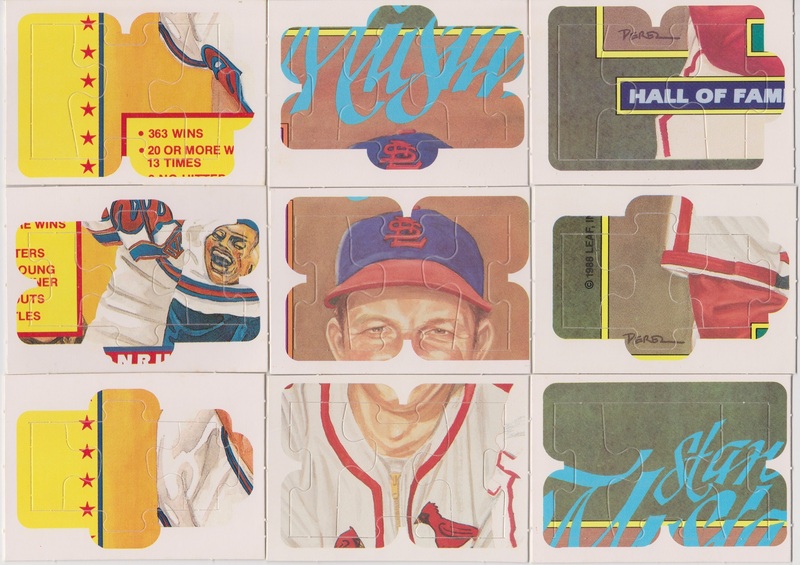 A mixture of a couple puzzles, which I think my dad put together and frames and I have somewhere so while I like Stan Musial, I didn't need these. While I probably had all these, it was still nice to pull the likes of Greg Maddux, Don Mattingly, Boggs, Ripken, Gwynn, Bo, and the Royals among others. Despite me being weary of getting this box with cards I know I didn't need, I think I got my money's worth just on some of the names from this batch. I can't complain. Plus 2 bucks would barely get me a pack of a current product so while quantity over quality isn't always a good thing, I think I got a mixture of both here. More cards I have plenty of, but hey some more Diamond Kings. 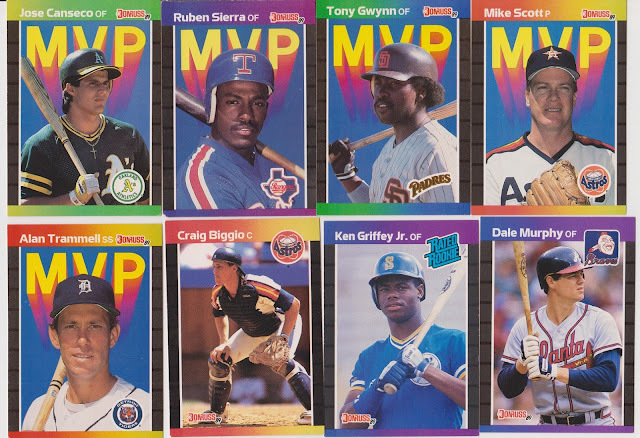 A Kirk Gibson to boot. I might need that for my PC, I'll have to look. SON, I got a Jerry Reed! Maybe not THE Jerry Reed, but when I left the store I was Eastbound and Down, so its a winner to me. Tom Henke is from the area and a guy I once worked with said he was related to him. I didn't dig too deep because I thought he was full of it and didn't want to spend a lot of time talking to him, but if true, that would be pretty cool. Then I was quite surprised what I saw next. A MIKE SCOTT MVP CARD!!!!! Wait... I mean A KEN GRIFFEY JR. ROOKIE! I know I have one or two already, but just imagine buying a blind box like this expecting a bunch of commons and pulling a Griffey? I was really surprised and shocked. I mean I was happy to pull the Gwynn and Trammell MVP cards as well as the Biggio, but the Griffey really overshadows any other card in this box so far. Well, probably ANYTHING in the box, but still. The rest of the box wasn't baseball, and I'll post next time because since I mentioned wrestling I thought I'd show off some wrestling cards today too. I saw this box at Walmart a few months ago and forgot if it was 15 or 20 bucks, and at first I was going to pass on it. But I was enticed by the thought of pulling an autographed Macho Man card and decided to get it. I can't say I was disappointed but as you'll see, no Macho Man autograph. 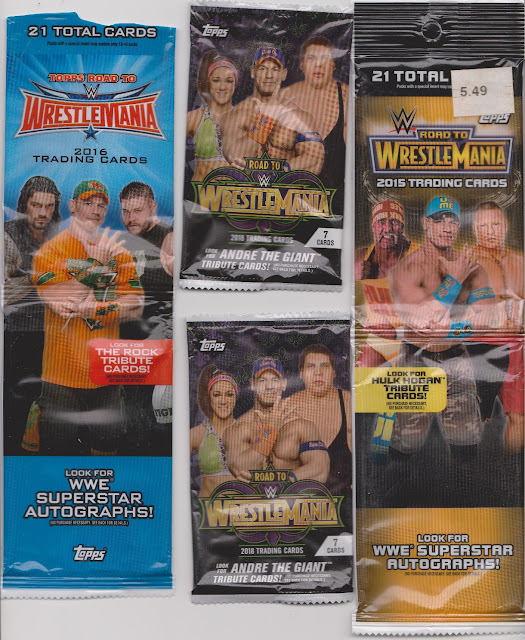 I liked the thought of the packs on the top, I like the Heritage cards and never opened any of the Women specific sets, so I liked that. However the Road to Wrestlemania packs worried me because I bought some before and didn't like the design, so out the gate I was starting to regret the purchase. Nope, not liking these. Not a fan of the design. It was cool to get the Sheamus and Cesaro card and The New Day and Revival cards. Plus I like The Miz, but overall, not impressed with these. A little better, but still not liking them. I do like the Bret Hart card though and glad I got the Piper. The Randy Orton card is weird, but I do like it. So far though, regretting the purchase. At best I could maybe find just the ones I wanted on COMC and got them cheaper. 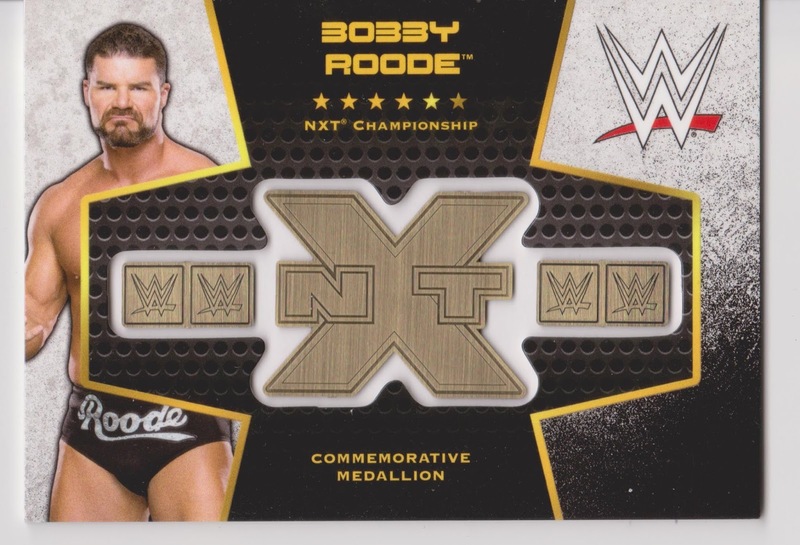 Maybe not, it seems wrestling cards on there aren't as cheap as other sports and non-sports. Here we go, lets hope I find a Nia Jax card.... maybe not... While I wish to have gotten a Nia card, aside from the Bayley, I was happy with the ones I did get. The bottom cards seem a bit plain, but I was happy to get the Sherri Martel card. I always liked her. While none of the others are my favorites, I was happy to pull them. It would have been cool to pull a Luna Vachon card. Speaking of Luna, I was quite disappointed WWE put her in the Hall of Fame as a Legacy induction. She deserved her own induction. If I get the WWE Network again in the future (I probably will soon), I might seek out Luna segments. I always thought she was interesting, aside maybe from the Oddities which I liked but didn't care for her being with them. More cards where I like the people on them, but not so much the design. Glad I got a Miz card with Maryse. If you never saw their TV show, its a fun one to watch at least once. If you know a little about the Miz you know he doesn't take himself too serious and the show does a good job showcasing that. I also like the Samoa Joe card and the Becky Lynch card. I never got behind Lynch much, but curious where she goes from here after headlining 'Mania. YES! Love these! Even though I got a double dose of AJ Styles, but that's not bad. It's funny these are called Rookie cards since he's had plenty of TNA released cards and I have a few. Nice to get the parallel Sgt. 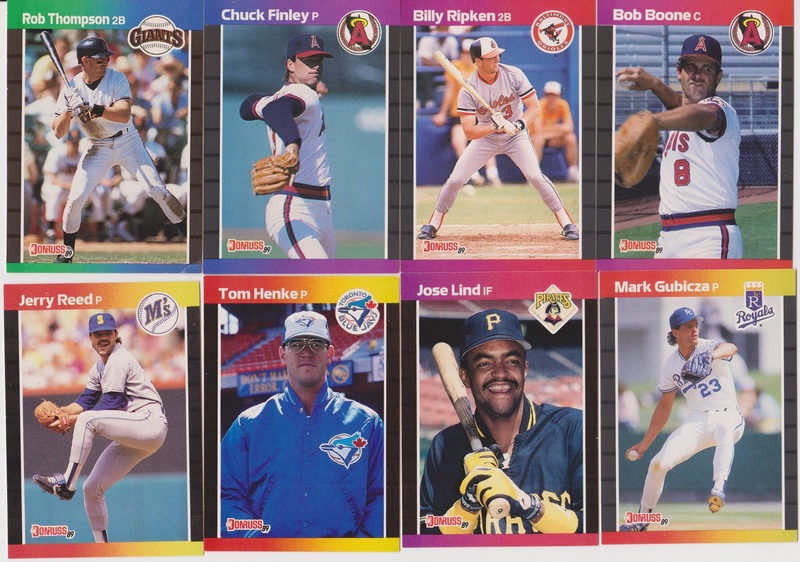 Slaughter card and some of the legends like JYD and the Fink. I like this design a lot, I'd been okay if most of the cards were from this set. I never cared for matchup cards like these but still not bad. I'm liking the Asuka/Billie Kay card though I don't know much about Kay. AJ and Cena had a good rivalry so that was nice to get too. Got another Miz card too. That's pretty awesome. Most Heritage sets are good, this one fell a little flat. However I'm not sure how they could have made it much better based on the design. That said, I do like the cards I got. I think the Tamina card was to troll me since I didn't get a Nia Jax card. A double dose of the dragon was cool, especially the turn back the clock card. 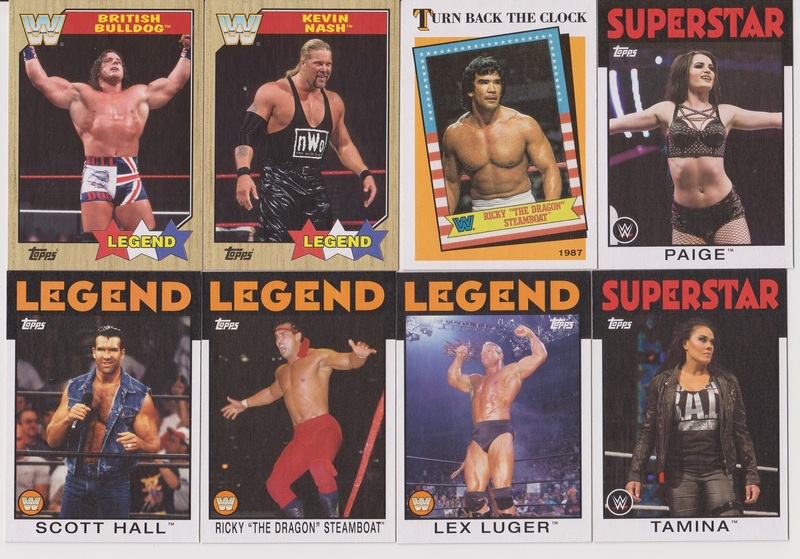 The Scott Hall card is cool because despite the WWE logo on the bottom, that was the night he made his WCW debut which lead to the eventual formation of the NWO. It wasn't his first stint in WCW, but it was his best one. It's too bad he never got the World Title while down there. The best card of the batch though is the British Bulldog. I was always a fan, and pulling this card really made up for a lot of the other cards I got. While I don't plan on adding a lot of wrestling cards to my collection in the future, I wouldn't mind finding a few older Bulldog cards. 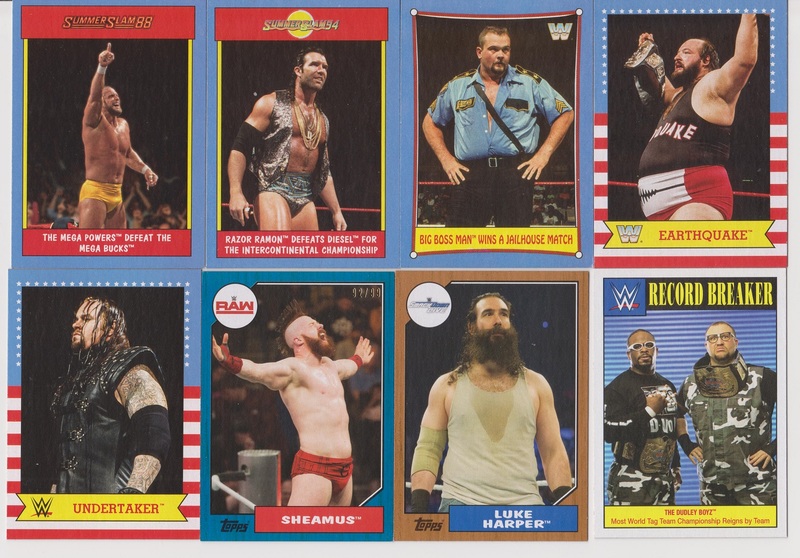 The Summerslam cards are kind of cool though not ones I really needed. I do like the Boss Man card though, despite some really horrible angles in his last go round with WWE I always thought he was a good guy and good character. Same goes with Earthquake. John Tenta just seemed really cool, and played a good heel. I like the design of his card and the Undertaker's. I do wish they used a different picture for the Taker, maybe from earlier on. The Sheamus card is a S/N card so it was nice to pull. I never liked Sheamus but it seems since he started teaming with Cesaro he realizes his role and is having fun with it. I think at some point he could get another world title shot, but for now, he's good where he's at. I was happy to pull the Luke Harper card too. Luke always looks like some relative I probably have but don't want to associate with all that much. Probably a cool guy, but its better off if I don't know. I really like his look and hope he can get a steady push as a singles competitor without another injury or delay. So I just realized I may or may not have scanned the Daniel Bryan card. 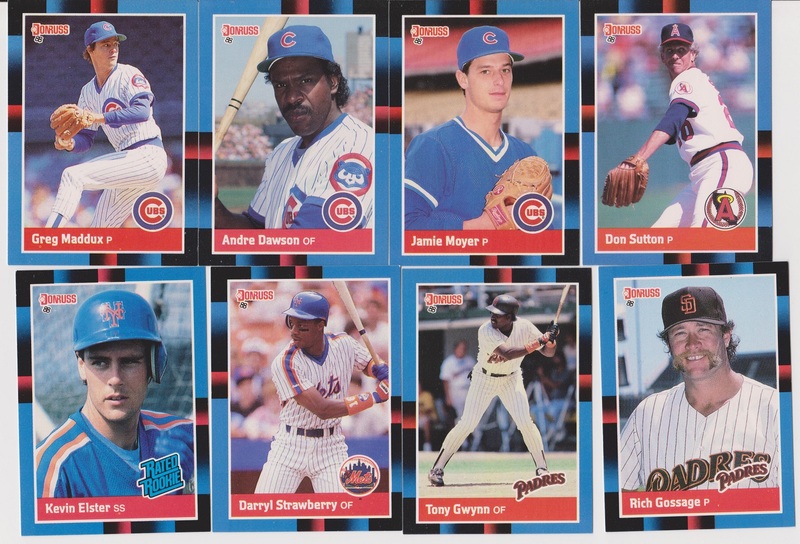 It may have been the one with Hogan in the first scan, or I just didn't scan it. Either way, I'm not too worried. However I do have one last card to show which was in the pack with the Daniel Bryan card. IS IT A MACHO MAN AUTOGRAPH???? No, I already said it wasn't. In fact its not an autograph at all, but still its not the worst card ever. These medallion cards aren't my favorite, and I'll be honest I felt a little let down, hoping for something better, but oh well. I mean if I opened a random pack and found this, I'd be happy, but not opening a box and this is their "hit". However, I do like Bobby Roode and while I thought he was better in TNA, I am glad he's in WWE because I can watch him more now, if they ever decide to give him a push. AHEM... kinda like Eric Young AHEM! Overall I'm not sure if the box was worth it, but I did pull some good names and got some good cards. I had fun opening most of the packs, so I'm not completely disappointed. Next time I need a wrestling card fix though I might look on DaCard World and see what kind of deals they have. 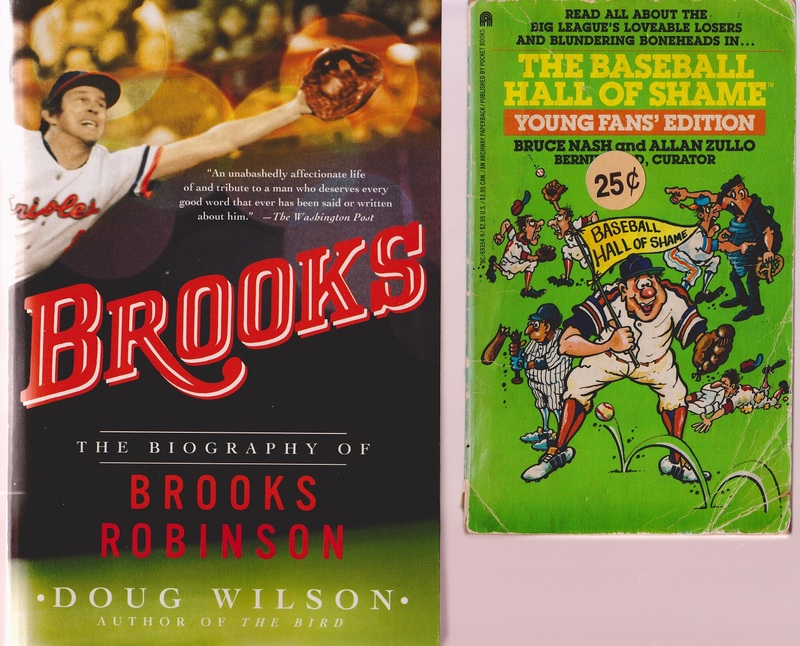 Before I wrap it up, I have one more photo of a couple books I got recently. The book on the left my sister found and thought I might like it. If she asked before hand, I might have passed on it, but still I might check it out once I finish a few others. I did some cleaning today and found about 20 or so books that I said I'd get to and are just stored away so I really need to start reading. The book on the right I did start reading today but didn't get far. It was at Savvy Seconds part of their 10 books for a quarter, and my mom had 9 books, so I just threw it in. It's basically a blooper book and its not too bad so far. I figure I'll finish it in a few days and the move on to something else. So that wraps it up for today. Next time I'll post the rest of what was in that box and also maybe a few more things to clean up some scans on my computer. Thanks for reading everyone and have a great week! I like all the cards. 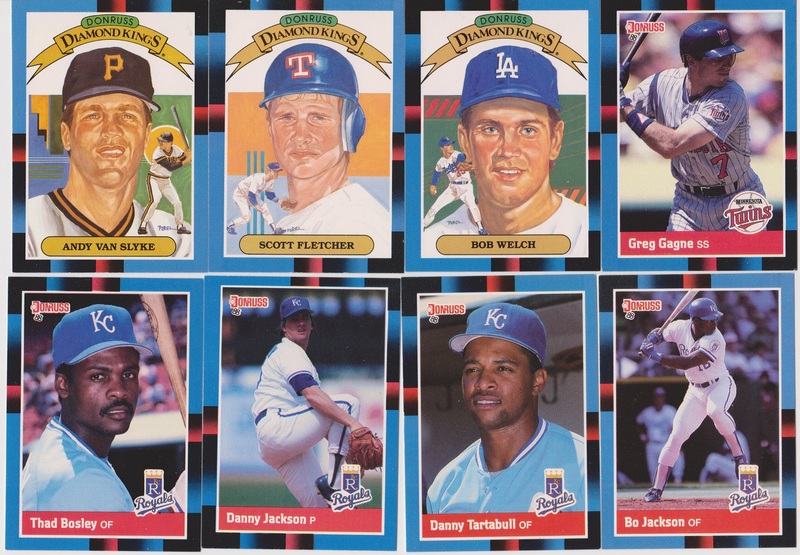 The '88 Donruss are favorites of mine and were plenty of great cards in both those. I wouldn't have hesitated on that box. The wrestling were good to. The Heritage are always fun. I definitely tend towards the ladies in the sport nowadays and you had plenty of good ones. Fun post. Thank you. The ladies have really stepped it up in the last few years. I think that's why their storylines are more compelling now. When you need a wrestling fix try Dollar Tree. They usually have random wrestling packs for $1. 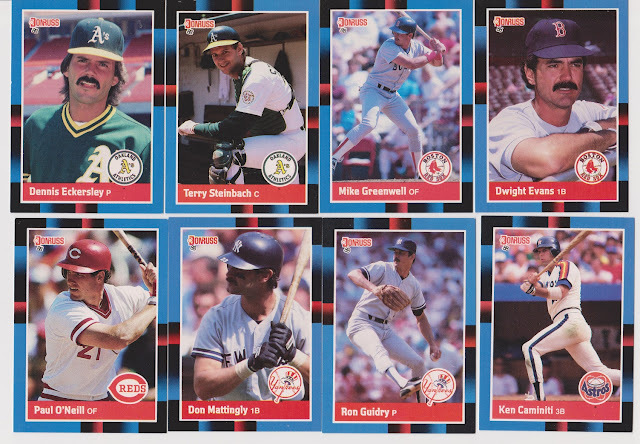 I'd love to find ANY packs of cards at Dollar Tree. My local store only has NBA stickers from 2 years ago and I think World Cup stickers. The rest are gaming stickers and such. They used to have good random packs but not for a long time. Now my trips to Dollar Tree are in hopes of finding movies.